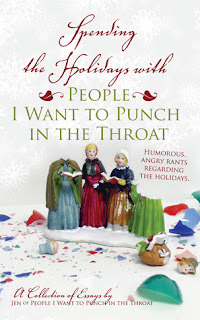 From the popular, hysterical and award-winning blogger Jen of People I Want to Punch in the Throat.com comes the next destined-to-be holiday classic! You'll want to make room on your bookshelf next to A Christmas Carol and Rudolph the Red-Nosed Reindeer for Spending the Holidays with People I Want to Punch in the Throat. So, grab a cup of hot cocoa, sit back and enjoy Jen's latest collection of humorous rants dissecting the “most wonderful time” of the year. She unleashes her biting wit and hilarious opinions on everything from cookie exchanges to annual humble brag Christmas letters from over achieving moms to horrifying Christmas' of her childhood. Jen is the author of the popular blog www.peopleiwanttopunchinthethroat.com. name pretty much says it all. It's not “Rainbows & Unicorns,” people. She's been accused of saying what everyone else is thinking and dropping the f-bomb liberally. This was such a fun read! I love to read Jen's blog: People I Want to Punch in the Throat and as soon as her book was released, I knew I had to read it. I love Jen's blog for her humor and snarky writing. She often says exactly what I'm thinking, and she's not afraid to speak her mind on anything. That's a trait I really admire! Jen's book is about the holidays (obviously). I think that the inspiration for her book came from her hilarious blog post about the Elf on the Shelf (read that post here). In fact, if you like Jen's Elf on the Shelf post, you'll love her book. Her book is full of essays about the holidays, some of them satirical, all of them hilarious. She covers topics like cookie exchanges and the annual holiday letters (which are actually opportunities to brag about everything your perfect family has done over the past year). I love Jen's open, honest writing and I love her perspective on things. It's so nice to know that I'm not the only one who feels this way about many parts of the holidays! I'm really glad I read this book and really enjoyed it. My one complaint is that it was quite short for the price. I wanted more: more laughs, more rants, more from Jen. I'm definitely going to be reading and buying her next book! LOVING the new look btw. And I totally have some folks I'd like to punch in the throat. :) I am really pleased with how it came out... I wanted it to look "like" Kelli. Thanks for sharing this. It is now on my wishlist. Thanks for writing a review. It's greatly appreciated!